and conceived for the event. Dimensions: m 140 x 10. Campo Fossoli, a place with a particularly painful history, has a strong personal significance for Maria Dompè. In 1944, it was a processing center for deportation to the concentration camps; after the war, it was taken over by the Opera Piccoli Apostoli (the Little Apostles), founded by Father Saltini, in order to create the “City of Brotherhood”. The community stayed from 1947 to 1952 and created the city of Nomadelfia, which was then moved to Grosseto, where it is still active. 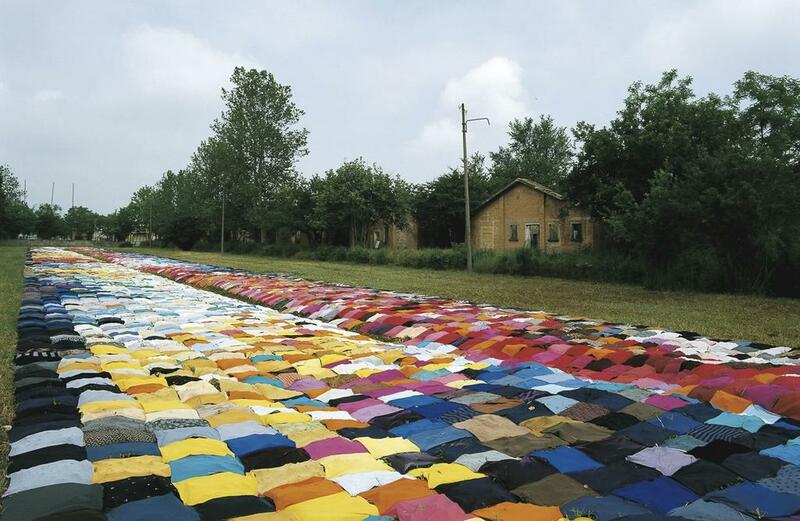 The naturalistic metamorphosis and the spring flowering, tangible signs of rebirth, have inspired the artist in this work: a composition of coloured cloth placed on the ground in a harmonious synthesis. 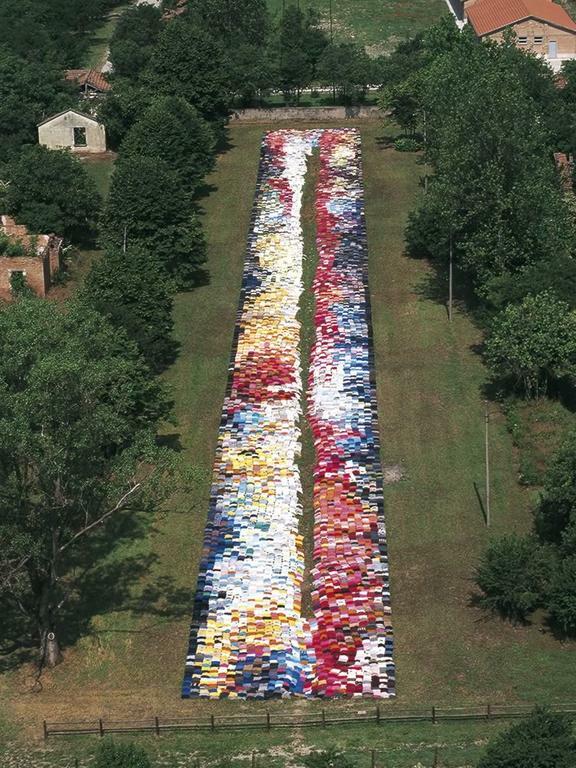 The image recalls us to the values of solidarity, the only antidote to violence. 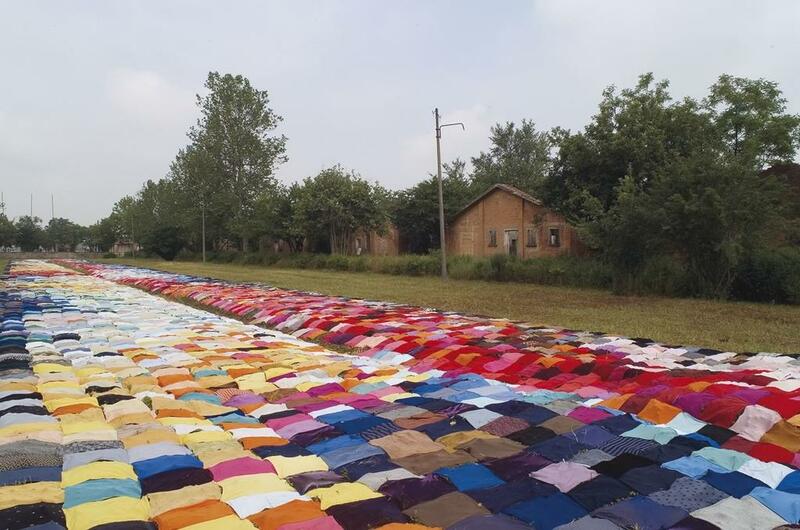 And so, where once fear and alienation reigned, there is a rain of different coloured cloths, bringing inside of the field, the normality of the traditional “carpigiana” manufacturing. The textiles are rediscovered for their ability to combine, to serve as stimulus to cooperation and to collective behaviours. The pieces are placed in order to suggest the idea of brotherhood: a fecund exchange of energy among those that are near or next to each other. To move close is to warm oneself, sharing their respective resources; and to associate without violating the boundaries of the other. 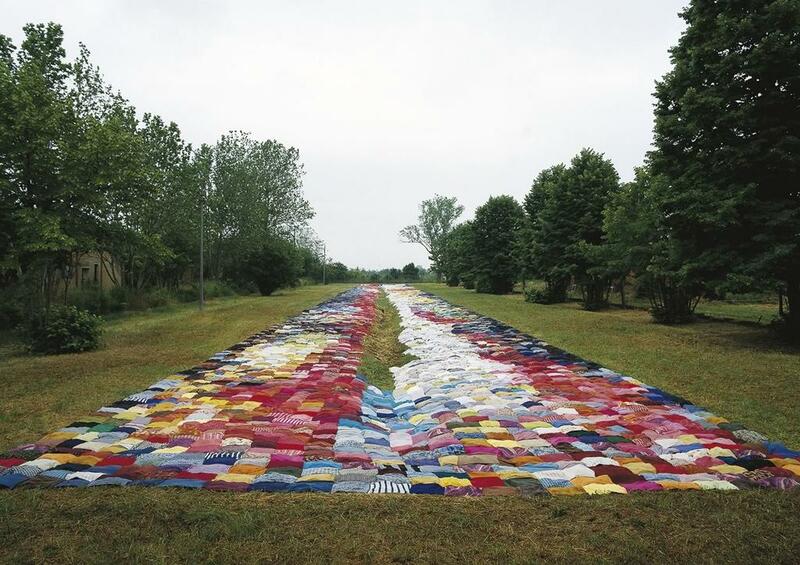 Moreover, the installation is made up of fragments, singularly insignificant, but indispensable for the cohesion of all. Yet again, Maria Dompè highlights the social essence of man, integrated in his environment and synchronized with its rhythms. The acoustic and olfactory aspects promote the involvement of the viewer, who is invested with a new awareness. Any forcing of the natural order provokes, in fact, devastating consequences, like the catastrophe of Nazism. Campo Fossoli helps us to not forget.